Ithaca, NY. Duncan and I hail from outside of Boston, and Harry is from Chicago. 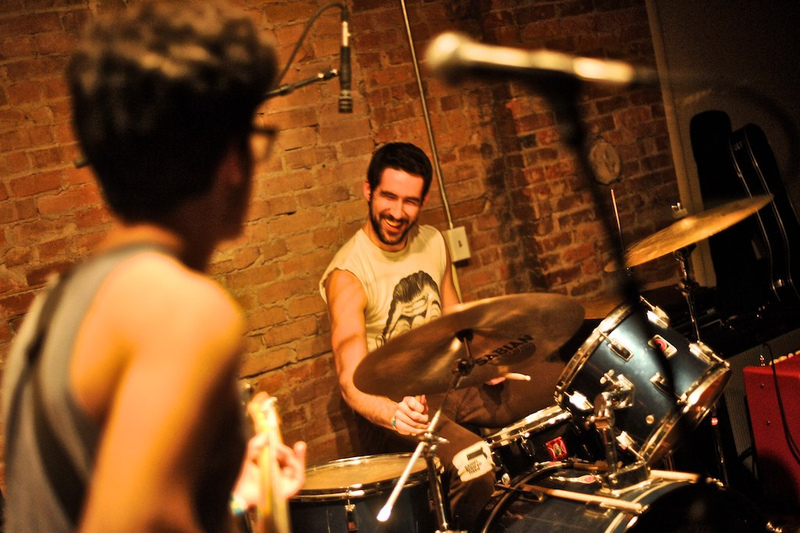 Duncan and I formed Pharaohs sometime in September of 2010, primarily because everyone else was playing in bands, and I was super jealous because I love to play drums and really wanted to play music as well. That's when Pharaohs started. Then over winter break we played with a bassist and it sounded so much better we decided pretty much on the spot to ask Harry to play bass for us. I think he was in an airport or something when we asked him. Duncan and Harry also both play in Music Band, and Duncan also plays in Tropical Punk. We're all influenced by a bunch of stuff coming in from all different directions. Duncan and Harry have been listening to Jeff The Brotherhood a lot lately. I've been listening to the new Smart Cops album a ton. Those new Graveyard, Capsule, and Ghostlimb albums come out in April and they're all going to be incredible judging by the sample tracks that have been released. I've also been jamming NYC punk band The Men a lot (wearethemen.blogspot.com), and the full length "Passages" by Tempest (ultra-heavy band from Canada) is one of the hugest albums I've heard in some time (tempestdestroys.bandcamp.com). Been listening to a lot of Mike Kirsch bands lately too (including his latest, Mothercountry Motherfuckers). Really though, we're just influenced by having a good time, so I think a lot of influence is just derived from us all hanging out with our friends. I know that's where a lot of the lyrics come from and what gets us all psyched. that stupidity is completely built into Pharaohs. Off street parking entrance at the corner of N. Fulton (Rt 13) and Court St or by entering the ally across from GreenStar Co-op on Buffalo St between Enterprise Rent-A-Car and Joe's Delivery.